Does drinking green tea burn calories? 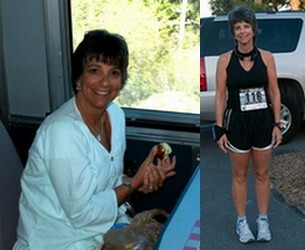 Ellen from Anna Maria shares her story on how drinking tea helps her lose 25 pounds in 6 months. Does Green Tea Burn Calories? See the differences? I am actually an instructor for a non-profit organization called The Cancer Project. It is made up of doctors, registered dietitians and nutritionists who support cancer prevention and survival through nutrition education and research. I teach a free 8 class cooking series. Personally, I have been eating a low-fat plant-based diet off and on for 20+ years. I began when my sister was diagnosed with breast cancer and I almost died of a colon blockage. I have done much research in this area, and watched with great sadness as I have remained the only healthy person in my family my age or older. Both of my sisters have heart disease, my other sister has diabetes. Both parents had/have heart disease and diabetes, and my mom and aunt also had breast cancer. My favorite weight loss book is The McDougall Plan for Maximum Weight Loss and Dr. Neal Barnard's A Physician's Slimming Guide. I don't get a thing for saying this, but I feel so glad when I see it work for many people. Slow weight loss is the best. The bottom line for weight loss is this: eat plenty of green and yellow veggies, and as many salads before meals as possible. One of the pictures above is from a race I ran. But I could not begin exercising that strenuously until I had taken most of the weight off. I had back and knee pain, which went away once I lost the weight and returned to eating a plant-based diet. I have lost 25 pounds drinking loose Dragon Well tea, in 6 months! I have tried other varieties of tea, but nothing works as well for me as Dragon Well tea. I drank 2-6 cups a day, 8 ounces per cup. Yes, I got a little hyper on the 6 cup end of that. I would usually do 2-3 cups in the morning, and do a second brew with the same leaves at lunch. Any tea later than that, and I have trouble falling asleep. I also make sure I drink plenty of water. That seems to help the weight loss and flush out the system. I think green tea burns calories. It seemed I had more thermogenesis - heat burning, sweating etc. And my hot flashes had been gone a long time after a return to a plant-based diet. This warm flush felt different from hot flashes. When I don't drink green tea on a daily basis (when I'm out of town, etc. ), I don't have that same heat-burning feeling. I apologize, but I haven't really tried a lot of other green or oolong teas once I locked into the Dragon Well tea. The oolong tea, such as ti kuan yin gave me a headache when I stopped drinking it. It and other darker teas seemed to have more caffeine, so I just stayed away. This is the best Dragon Well tea I ever tasted. I've been ordering Dragon Well tea from several different companies during the past year. Yours tasted fresh, fragrant and appeared to be in better shape than the other companys' teas. So I'm pleased that I've found an online source I can rely on for quality. One company I ordered from took months to fill the order, and then only after many follow-up e-mails. Thanks again for your great product and prompt service. I'll be ordering more when I run out. Ellen can be contacted at Vegcoach.com. She recently published a new book Eat Vegan on $4.00 a Day: A Game Plan for the Budget Conscious Cook .